Using her experience in the Flock House as a point of departure, Heather is working on a chapter focusing on Mary Mattingly’s work for her forthcoming book. Dwayne is writing an article for Edible Omaha Magazine chronicling his experience in the Flock House and also considering how the the structure’s gardens might provide sustainable food for future inhabitants. An avant garde opera singer who makes sound poetry, Amanda is using new material she developed at The Union for Contemporary Art to create sonic landscapes. A reporter with the Omaha World-Herald, Carol is using her stay in the Flock House both to write an article about her experience and work on her forthcoming children’s book for the Henry Doorly Zoo in Omaha. Kim will oversee four ten-year-old girls who will run a lemonade stand from the Flock House. They will donate their proceeds to the Nebraska Humane Society. Neil will create a sound exhibition by layering recordings of the Flock House installation and interviews with people who helped during the design build process. The sound will then occupy the space during his stay. Nicholas invites the public to join him for meditation and yoga Tuesday in the afternoon and Wednesday in the morning. There will also be a musical performance Tuesday night starting at 8:00 pm. He invites visitors to experience the Flock House's space and what Nicholas has accomplished with his site specific installation. Pierre will use the space to paint and draw whatever he is inspired by within the Flock House and his perception of it. He will also record himself the entire time to document his stay. Join Amanda, the Bemis's consulting curator and artistic director, as she shares her bright green thumb to provide advice, guidance and free consultations about community gardening. In addition to using the Flock House as a painting studio, Peter is inviting local musicians to join him for band practice and concerts. Come and rock out with Peter in this unique live music venue! Paige and Teal will conduct and record interviews with past and current Ethel Mae residents, people who lived in a communal living situation in Midtown Omaha. They will work together to complete collaborative projects as well as produce small gathering events. In so doing, the duo will work through some of the failed utopic ideas that occurred around the housing project. Both the interior and exterior areas of the Old Market Flock House will serve as space for Play Lab, a free and open play workshop for kids of all ages. Materials and support will be provided for both kids and adults to engage in creative, spontaneous play. Play Lab is organized by current Bemis Center Artist-in-Residence Teal Gardner. During her time in the Flock House, Laura will be reflecting on library workshops she led around Social Studies, her recent solo exhibition at the Dale W. Clark Library in July, and facilitating interviews with several work shop participants about their experiences. Cynthia will use the Flock House as studio and exhibition space and conduct tours with local art and nature enthusiasts. 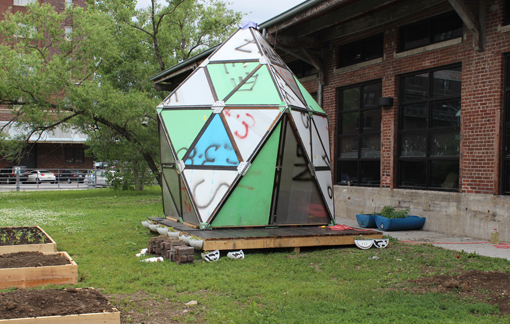 She will also be doing a project called Palimpsest and invites friends, members of her Iowana Farm Community Supported Agriculture group and the public to consider the idea of Flock Houses by documenting and translating their ideas into a layered expression. The Flock House is open to the public to participate in the project as contributors and to make art together around the idea of the structure. This includes: planning, drawing, curation, stamp making and using stamps, stencil making and using stencils, documentation, resist ink drawing, writing and reflecting. For Old Market Flock House updates and to read about the participants' experiences, visit our Tumblr account here.